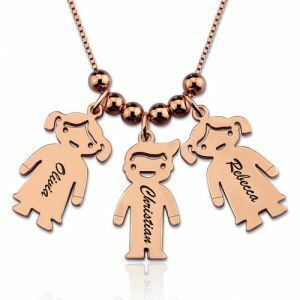 Engraved Kids Charm Necklace can be ordered with multiple personalized boy or girl charms according to your choice. And then you can engrave each kids charm with the name of the child it represents! Since you can get as many charms as you need, this children charm necklace makes an ideal gift for mothers, grandmothers and children alike! It is a perfect necklace for moms everywhere! 2.The number of beads on the chain only are up to 6.